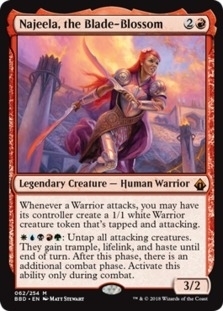 Battlebond has been fully spoiled at this point, and there was one clear winner in my mind when it came to new legendary creatures to build a deck around: Najeela, the Blade-Blossom. From being able to take extra combat steps (Relentless Assault, Savage Beating, World at War), to buffing your creatures (Overwhelming Stampede, True Conviction, Cathars’ Crusade) to Warriors matter (Raiders’ Spoils, Secure the Wastes), to standard tribal includes (Kindred Discovery, Coat of Arms, Vanquisher’s Banner), you’ll find a ton of synergy and should be making a ton of tokens and buffing your creatures quickly — then take as many combats as you need in order to smash you opponents. I’m not sure where Najeela will fit on the tier list (probably around tier 3) but I think this deck will be fun to pilot nonetheless. You could also go a completely different route and still make use of her extra combat ability, but I think tribal warriors is the way to go! You can see the full deck list here. 5 color decks blow my mind. Good news is, Standard is coming to MTG:Arena soon so I’ll be able to try out more of your decks! Well abridged versions at least lol. Plenty of non standard cards here. But a couple old war reports were on standard decks, though some of those cards aren’t legal anymore.